American Idol finalist James Durbin and recording artist Orianthi played a special concert at Center Staging in Burbank, CA on March 2 to benefit the Rock School Scholarship Fund, a non-profit group that funds music lessons and provides instruments for kids 7-17 who want to attend any rock school nationwide, but whose parents don’t have the financial means. 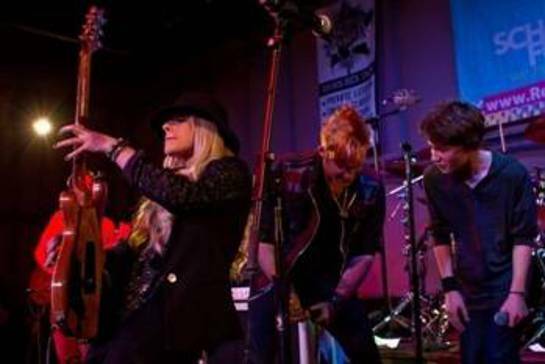 In this photo, Orianthi (left) is shredding while James Durbin (center) rocks out with one of the students. James, a former scholarship student, performed his original song “Stand Up” with NINE, a student band from the Burbank Music Academy. He and Orianthi later performed Ronnie James Dio’s anthem “Rainbow in the Dark” with the School of Rock North Hollywood. 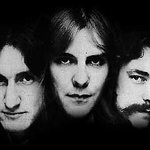 For James, it was the first metal song that he ever heard and the rocker dedicated the song to Ronnie. Additional celebrity items in the silent auction included a PRS SE Orianthi Red Sparkle Guitar signed by Orianthi, a Fender Squire Special Edition Guitar signed by James Durbin, an autographed R.E.M. drumhead, a private guitar lesson with new music artist Erica Chase, two VIP meet and greet tickets to any Todd Rundgren concert, two Orchestra tickets and cast meet and greet for “Rock of Ages” at the Pantages Theatre in Hollywood and a tour of the Fender Guitar Factory for a winner and four friends. During a break in the concert, Center Staging General Manager Michael Anderson also surprised the school with a $5,000 check while donations from event sponsors Monster Energy Drinks, Karma Tequila and St. Clair Brown Winery raised additional funds. For more information about the Rock School Scholarship Fund, visit www.RockSchoolFund.org.